Promoting the welfare of the college through advocacy, fundraising and service — that's the important role our Dean’s Board members play every day. Through their involvement and engagement, they advocate for the humanities and social sciences at NC State, across the state and beyond. Susan is the current chair of the College of Humanities and Social Sciences Dean’s Board. She serves on the Board of Directors and as Vice President of the Commonwealth Home Health Care Group. She retired from the state of NC after serving as a commissioner for the North Carolina Utilities Commission, Senior Assistant for Administration for the Governor's Office, and Deputy Attorney for Administration for the North Carolina Department of Justice. After graduating with a BA in Political Science from NC State, she attended law school at the University of Virginia. She is a member of the North Carolina State Bar and is a North Carolina Certified Mediator. For her outstanding service and achievements, she was named the 2013 CHASS Distinguished Alumna. Emily has recently embarked on a new career, and is currently a real estate professional with Hodge Kittrell Sotheby’s International Realty. Prior to this new endeavor, Emily was a successful fund-raising professional, serving in several senior roles including Vice President and Chief Development Officer of the Rex Foundation and Vice President of Development at the Food Bank of Central and Eastern North Carolina. Paul is the CEO at Strategic Pharma Solutions, Inc. a Raleigh-based healthcare communications agency focused on marketing solutions for pharmaceutical, medical device and biotechnology companies. Prior to Strategic Pharma Solutions, Paul held several industry leadership roles including at Healthstar Communications and GlaxoSmithKline. Kathy first joined SAS in 1977, and has served as vice president since 1985. As the head of the SAS publications unit, she oversees development and delivery of online and printed documentation and information products that support SAS products globally. 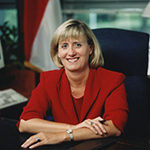 Kathy has held numerous leadership positions at NC State, including as a member of the Board of Visitors and the NC State University Foundation. Lynn started The Daniel Group in 1989, providing strategic planning, research and training services designed to help companies measure, manage and improve customer service. His background includes more than 11 years of management consulting experience with Norelli & Company, corporate planning and new product management positions with Rexham Corporation (now Rexam Corporation), as well as sales and sales management experience with Eli Lilly Company. He is a past president of the NC State Alumni Association. Cristina is vice president of legal operations in North America for GlaxoSmithKline. She is a healthcare and pharmaceutical attorney, practicing in Research Triangle Park, North Carolina. Her practice has focused on providing contractual, regulatory healthcare and corporate legal services to corporate clients. Particular emphases include advising on commercial contracts, FDA laws, the application of government pricing and reporting laws (Medicaid, Best Price, PHS, ASP FCP, Non-FAMP), drug reimbursement, antitrust, healthcare fraud and abuse laws, and corporate compliance. Lee is a Medicare contractor medical director for Palmetto GBA (Medicare Jurisdiction M) He was previously with Blue Cross and Blue Shield of North Carolina. He was previously in private practice as a nephrologist for 20 years in Raleigh, and also served in the US Air Force as a physician for 20 years. Lee has been an integral part of the Raleigh community through service on multiple nonprofit boards. Roger serves as senior associate general counsel in the Sam’s Club Division of Wal-Mart Stores, Inc., where he provides legal support to various business units, including marketing, membership, member insights, e-commerce, corporate communications, credit and finance. Before starting his career at Walmart in 2002, Roger practiced law for 12 years at an insurance defense law firm in Atlanta. Roger currently serves in executive and director positions on several professional and community organizations. Marquan is currently a senior at NC State and is from Shelby, NC. He is involved in a multitude of organizations including being the President of the CHASS Ambassadors, a Pack Promise & Trio Scholar, and an Undergraduate Admissions Intern. He has plans to go into law, politics, and policy to evoke change that will benefit low income and impoverished communities. Angela has significant experience in higher education, and is executive director for Higher Education at Doolli Inc, a STARTUP-NY technology company. She most recently worked at Fullbridge Inc., and previously at Xerox, Blackboard Inc. and The Chronicle of Higher Education. Angela is completing her MBA at Columbia Business School. David has over 40 years of experience in the financial services industry, including both commercial and investment banking. David is senior vice president and commercial relationships manager for Middleburg Bank in Williamsburg, VA.
Dean is chief operating officer for Renfro Hot Sox LLC, an innovator in fashion socks and hosiery. Dean has over 20 years of senior management experience in sales, marketing and operations. Reggie has been a pastor his entire professional career. In addition to ministering to the needs of congregations throughout the state of North Carolina, he has also served in leadership roles in numerous civic organizations. Reggie is currently the senior advisor for legacy giving at the United Methodist Foundation. Robert serves as the Chief District Court Judge for the Tenth Judicial District of North Carolina, which encompasses all of Wake County. He has served as a district court judge for the past 20 years and as a practicing attorney for eight years prior to being appointed to the bench by Governor Jim Hunt. Robert has served on the executive board of numerous professional and community organizations. Jane is an entrepreneur with 35+ years of experience working in various leadership roles within the public and private sectors. She recently served as a consultant to improve train travel in North Carolina and to secure the funding for rail corridor improvements. Her professional career is punctuated by development and fundraising. She has worked with environmental and educational organizations in and out of North Carolina and found time to volunteer with many nonprofits, including NC State’s Center for Environmental Farming Systems, the NC Museum of Natural Sciences, Raleigh Precinct 01-29 and Quail Ridge Books and Music. With more than 15 years of experience leading marketing efforts in higher education, Jason is vice president and partner at Simpson Scarborough. In addition to corporate and agency branding experience, Jason previously served in marketing communications leadership roles for the University of California System and NC State University. A regular speaker on marketing strategy, he currently serves as co-chair of the AMA’s Symposium for the Marketing of Higher Education. He has also penned articles or been featured in CASE Currents, Marketing News, The New York Times, NPR and other media outlets. Bing is an investment professional with Morgan Stanley Smith Barney and head of The Sizemore Group. He serves as a board member on the NC State Board of Visitors, the State Club, and Friends of Arts NC State. John is senior vice president of content operations for AT&T Entertainment Group, where he is responsible for content operations for TV platforms with regard to sports blackout implementation and special events, program planning, traffic operations, and audience network on-air operations. His team also manages the studios that produce The Dan Patrick Show, The Rich Eisen Show, The Box Score, NFL Sunday Ticket and its accompanying Red Zone and Fantasy Zone programs. Prior to joining the company in 2005, Ward held a variety of positions at FOX Sports Productions. John has won 12 Sports Emmys for his work in sports broadcasting. Adama is an energetic community member involved in a number of civic and school organizations. She is the proud mother of three children who keep her extremely busy with their academic studies and extracurricular activities. David is a wealth advisor with The Carolinas Financial Network. A 26-year veteran, David advises individuals and closely held businesses on investment management, risk management and estate planning opportunities. David has been involved with NC State over the years in capacities such as Alumni Association board and State Club board. He is very involved in several nonprofits and is an avid Wolfpack fan. David, Ann and their two boys live in Raleigh.